Unleash Your Imagination...With No Design Experience Needed! 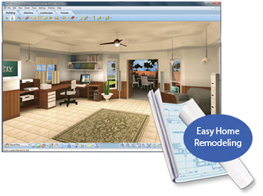 Take a fresh approach to the way you live with Virtual Architect Professional Home Design 8.0. This innovative home design software delivers the powerful tools and inspiration needed to transform your living space, plus expert help to get the job done right. It’s the ideal software for updating any room in your home, exploring your design style or redecorating using your existing furnishings. From a green kitchen to a dream home to living rooms, bathrooms and more, you’ll find all the tools you need to easily plan, create and experience your new living space – all before spending a dime..
Update, Redecorate, Remodel and More! Intelligent Walls: Easily draw interior and exterior walls that atomatically connect and repair. Doors: Use the Door Wizard to add simple doors, bi-fold doors, French doors, sliding doors, garage doors and more. Windows: Just click along a wall to insert casement, hung, sliding, bay, vent, hopper or louvered windows, plus windows in virtually any shape. 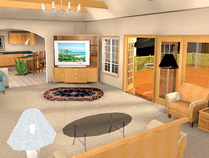 Replace Paint and Fabric: Take a digital picture of any room and visualize your new space. 3D Walkthrough: Create virtual tours to visualize your finished living space before you ever start your project. Accurate Natural Lighting: Visualize your home's interior at different times of day. Automatic Roofs: Insert roofs in any shape or style. Adapt Bathrooms for Disabled Use. Terrain Modeling: Easily specify hills and valleys. Garden Visualizer: View plant growth and seasonal changes. 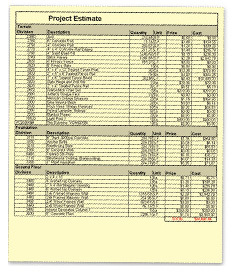 Plant Care Calendar: Identify the optimal times for planting, watering, pruning, fertilization and spraying. Deck Builder Wizard: Automatically build decks and patios in virtually any shape, size or material. Add New Landscape to Your Own Digital Photos. Terrain Modeling Tools: Design your home anywhere, regardless of topography. Collision Control prevents objects from being inserted where they do not belong. 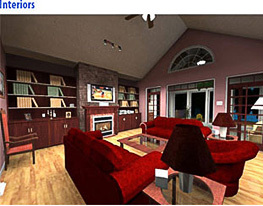 Add Digital Photos of any home furnishing to your 3D home designs. Even add a photo of your family. Want to update your kitchen? Considering a small project like refinishing cabinets or a totally new space complete with granite countertops, hardwood floors, stainless steel appliances and more? 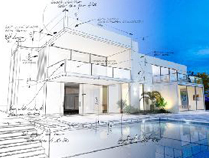 Whatever size project you have in mind, Virtual Architect software gives you the easy yet powerful creative tools needed to turn your dreams into reality today! No Design Experience Necessary - Using a wizard-driven interface with drag and drop simplicity, Virtual Architect software makes it easy. 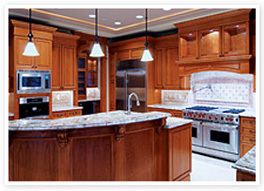 Countertops - choose from granite, marble, slate, ceramic tile and more. 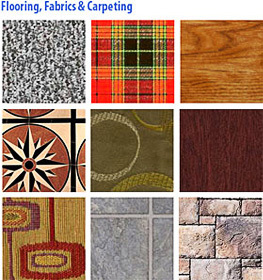 Flooring - replace your floors with slate, hardwood ceramic tile and more. Photorealistic 3D Views - Virtual Architect's powerful design software lets you take a virtual tour and experience your newly designed kitchen in brilliant 3D! Tired of your outdated bathroom? Looking for new ideas and ways to modernize old counters, floors, cabinets and more? Let this powerful software help you create and design the beautiful, functional bath you've always wanted. Be it a complete remodel or a quick makeover, Virtual Architect's software gives you everything you need to get started today! 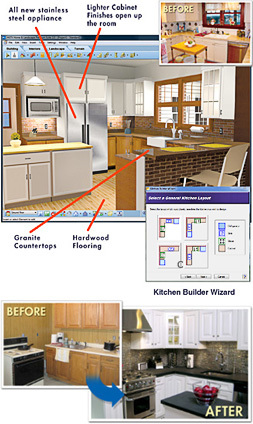 No Design Experience Necessary - Facing a remodel can be a daunting experience but Virtual Architect's software makes it easy by using a wizard- driven interface. 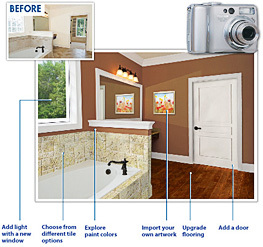 Get Started Fast - Easily upload photos of your current bathroom or use the bathroom design wizard to outline and create the room you've always imagined. 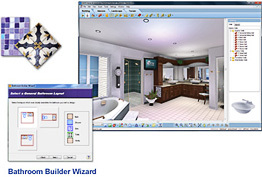 Virtual Architect’s bathroom design software allows you to see what the finished project will look like before you start construction. Countertops & Cabinets - Choose from marble, slate, ceramic tile, limestone, quartz, ganite and more, plus 200+different cabinet styles and finishes. Flooring - Replace your floors with ceramic tile travertine, slate and more. 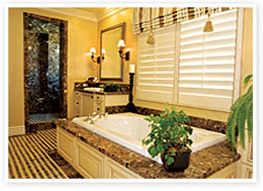 Bathtubs - Visualize a new deck - mounted, integrated or free-standing bathtub. Bathroom Ideas - Need ideas for matching favorite materials? No problem. From traditional to contemporary, Virtual Architect software is fully loaded with great design ideas for an impressive new space. Select from 200+ different styles. Then apply the finish of your choice. Choose from marble, slate, ceramic tile, limestone, quartz, granite and more. Visualize your new deck mounted, integrated or free- standing bathtub. Photorealistic 3D Views - Virtual Architect’s powerful bathroom design software lets you take a virtual tour and experience your newly created bathroom in brilliant 3D! 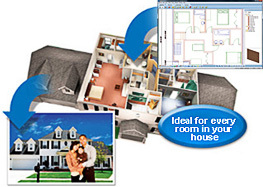 Easily plan room additions, remodeling and other projects. Then see the results in photorealistic 3D! Even take a virtual “walkaround” in your new space. Specify doors and windows. Then add cabinets, lighting, window coverings, flooring, paint and more. It's easy to design your entire project in 3D! Add office equipment and furnishings. Then render your design in photorealistic 3D - and your plan is complete! 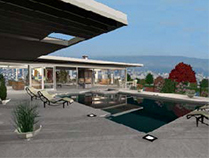 Photorealistic 3D Views: Using this comprehensive remodeling software you will be able to view your new design in 3D. Walk through your dream home in virtual reality! Get enhanced realism in your 3D renders with Presentation Mode. Whether you're planning a one-day remodel, room addition or building a new home from the ground up, Virtual Architect floor plan software provides all the tools you need to produce professional floor plans that keep your design project on track. With its easy wizard- driven interface, generating floor plans and even designing brand new interiors has never been easier - just drag, drop and draw! Home Builder Wizard: Get started today with thousands of floor plans to help you easily design your dream home. Foundation Builder Wizard: Designing plans for new rooms is as easy as clicking and dragging your mouse! 3D visual generated in just under an hour! Design in photorealistic 3D and even generate a "Virtual Walkthrough." 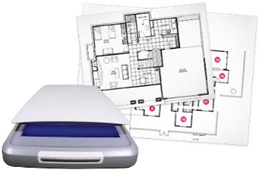 Get Started Fast – Scan in current photos of your room or use the interior design wizard to sketch your space. Using drag and drop technology, you can effortlessly discover a new design style! There's never been an easier way to plan and visualize beautiful, new outdoor surroundings than with Virtual Architect’s software. 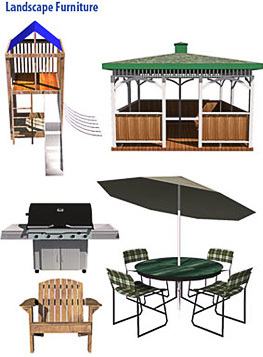 From lighting, pathways and plants to decks, gazebos and more. This powerful, easy-to-use software lets you transform an outdated yard and garden into a flourishing, fresh and functional landscape - right before your eyes! Creating your new deck is easy with the Deck Builder Wizard - just select materials and dimensions to create your space, then add plants, fences and accessories for that finished look. Make your property outdoor living space totally unique with custom features that work for every season. 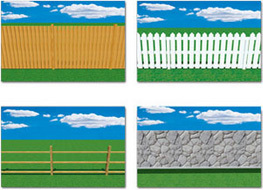 Built fences and gates with complete control over number of post, post size and rotation. Simply drag and drop trees, plants and flowers from our massive plant library. Even see the size of plants as they grow from year to year, making planning easy. Then view your space in 3D to fine-tune your design. 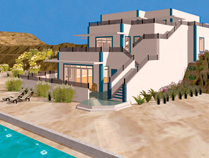 There's never been an easier way to plan and visualize a beautiful, functional landscape than with Virtual Architect! From lighting to pathways, decks to gazebos and more, you can transform your outdoor living space in no time at all! Easily add sidewalks, and driveways, plus wood, sand, gravel, concrete, brick, flagstone, boardwalks or asphalt walkways. Even accent your garden with a forest path. 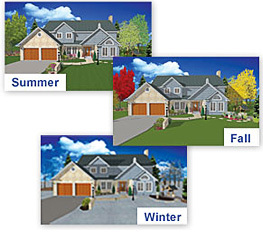 Watch how your landscape will mature over time. From your first year's planting to 50 years down the line, you can preview your plants' growth and see how well they will complete your ultimate outdoor living space. 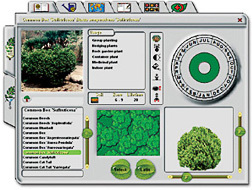 With an extensive Plant Encyclopedia and Irrigation Planning tool, you'll save time and money using this garden design software before breaking ground. Plant Encyclopedia: With over 7,500+ plants, trees, flowers, shrubs and groundcover options to choose from, you can customize your garden any way you like. Want to know what thrives best in different areas of your garden? 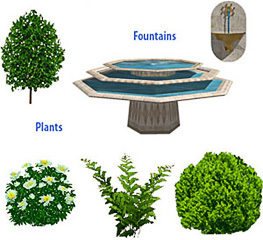 Virtual Architect garden design software also includes important information about your chosen plants' climate, water, light and soil requirements! 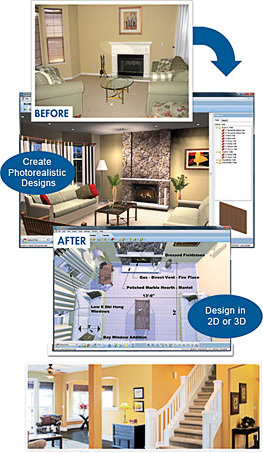 Creating the look of your dream home just got easier with Virtual Architect's powerful easy-to- use home design software! Whether you want to build a new home or just want to remodel your current one, with a simple click of the mouse, Virtual Architect home design software gives you all the tools you need – and there's no design skills required! 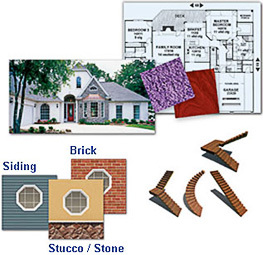 Thousands of home plans to get you started! 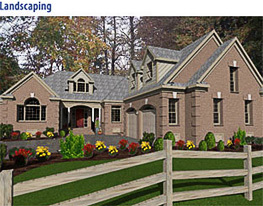 Start with an example from our extensive home plan library! 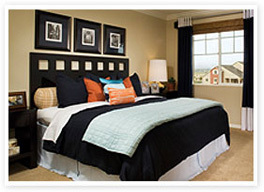 You choose the house style, number of floors, bedrooms, bathrooms and more. Easily add brick, stone, or other materials with complete control. 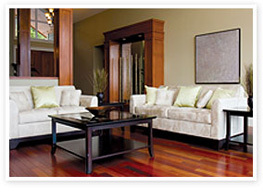 Upload photos of your current home's interior and do a virtual room makeover. 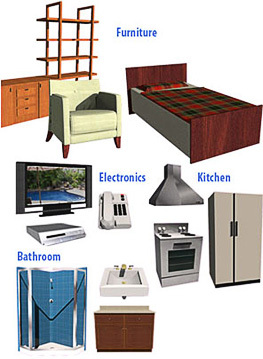 Select from an extensive library of 3D furniture, appliances and materials for your home's interior and exterior. Room Makeovers – Whether you're remodeling a room or redecorating an outdated one, Virtual Architect home design software is like having your own interior decorator in a box! With Virtual Architect innovative photorealistic, 3D visualization capabilities, you can design your dreams then watch them come to life! Thousands of 3D graphic samples help you visualize and plan your brand new space. Just drag and drop into place! 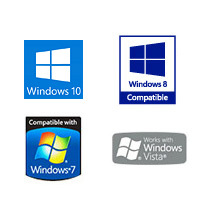 • Windows® XP is no longer supported by Microsoft®. **The user is responsible for all Internet access fees and phone charges. • Note: Required for Virtual Architect Home Design Professional. 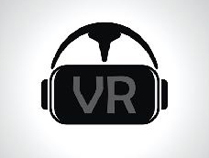 For current recommendations and performance testing tools, go to http://www.htcvive.com/us/product‐optimized/. For current system requirements and a compatibility testing tool, go to https://support.oculus.com/1633938460220125/.